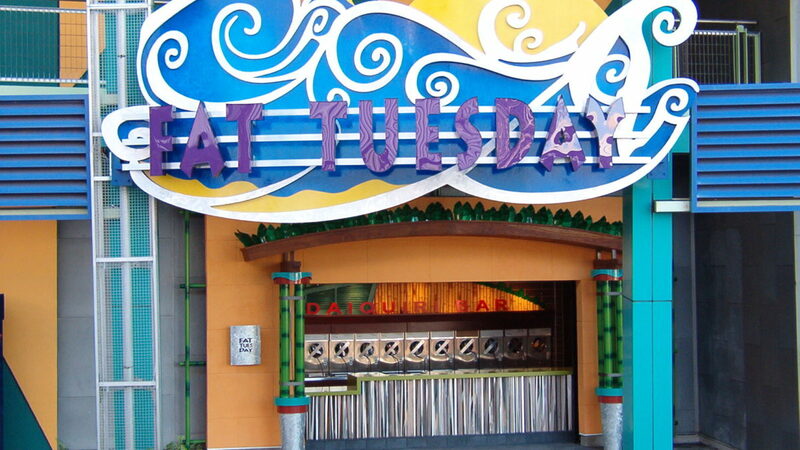 Fat Tuesday is a chain of more than 50 daiquiri bars located throughout the US, Mexico and Honduras. The company recently opened a new franchise right outside of Universal Studios in Orlando. 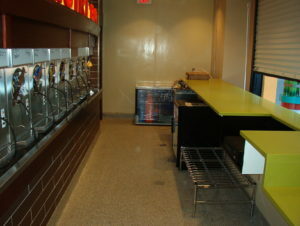 Twelve frozen daiquiri machines line the back of the small serving space, with a walk-upbar for customers. Back of the house includes refrigerators to store the mixes, as well as access to fill the tank of frozen daiquiri machines. Fat Tuesday Orlando opened in March 2010. Bert Turner, architect with Mouton + Long Architects, spent a few minutes to talk about this project with us. Q: What was the background on the design of his project? 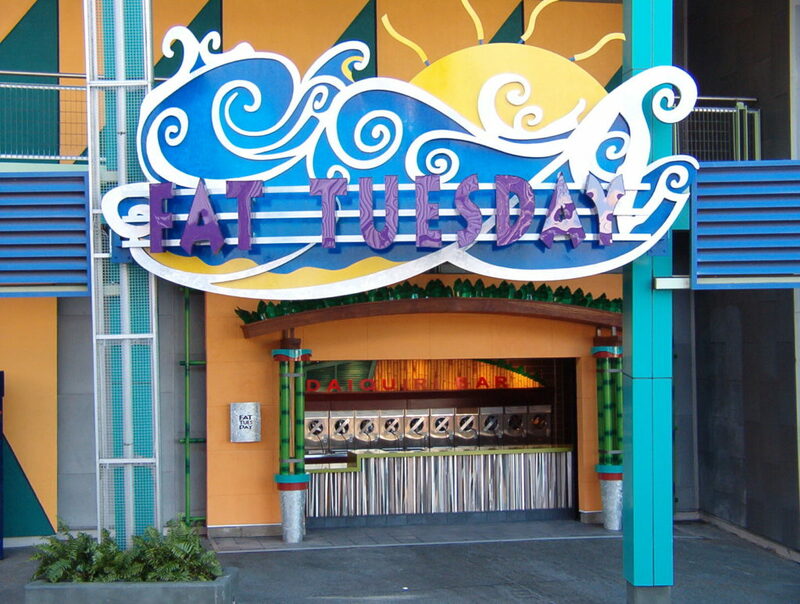 BT: We have worked with the Fat Tuesday/New Orleans Original Daiquiris chain on a number of their buildings. For this location, at Universal Studios in Orlando, we wanted to take it up another level. The design is meant to be a contemporary Caribbean theme. The front of the bar is made from folded stainless steel. The contractor took stainless steel sheets and brake formed it to give it that look. The columns supporting the arch over the bar are aluminum painted to look like green bamboo with a metal base. The client is very happy with how this turned out, and they are looking to incorporate elements from this into future projects of theirs. Q: Why did you choose Everlast Epoxy floor? BT: It’s the best kind of color to have on the floor since it doesn’t show wear like other materials would. For us, the durability of the look was key. The epoxy floor is used throughout the serving area and the back of house. Q: What other benefits were there for you in using Everlast Floor for this project? 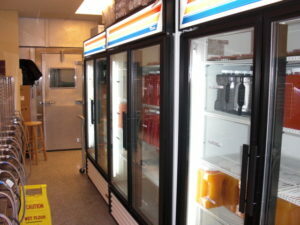 BT: The space for this bar was formerly a hot dog stand and had a standard tile floor. It was easy for the epoxy to be troweled over the existing tile and tile base and tie in with the FRP (fiberglass reinforced panels) walls. If we didn’t use the epoxy floor, we would need a separate waterproofing detail there. Having the Everlast Epoxy floor also makes the floor monolithic and makes the cleaning easy. Q: Were there any other special health or safety concerns for this project? BT: We included a stainless steel piece between each of the daiquiri machines to keep spills from falling down in between the machines. Q: Were there other interesting materials used in this project? BT: The stainless steel for the front of the bar is one. This was also one of the first times we used Caesar Stone for the bar counter. It also gives us a seamless material for the entire length of the bar. Q: What is your overall impression of Everlast Epoxy? BT: Universal initially recommended to us that we look at Everlast Epoxy. We are impressed by it, and we hope to use it on other projects in the future.